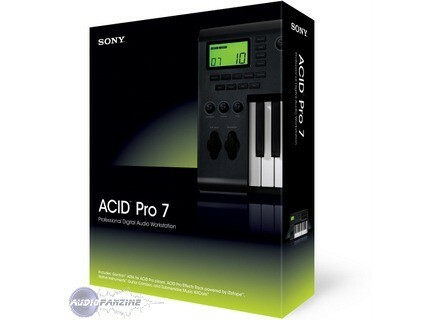 ACID Pro 7, Loop Sequencer from Sony in the Acid series. Product replaced by the Magix Acid Pro 8. 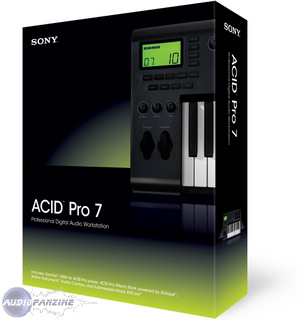 Sony Creative Software has updated ACID Pro to v7.0a. The élastique plug-in has been updated for improved performance. When the Close audio and MIDI ports when ACID is not the active application check box in Preferences > General is selected, external control is also suspended when ACID is not active. When you edit a clip in an external editor, audio, MIDI, and external control hardware is released regardless of the Close audio and MIDI ports when ACID is not the active application check box setting. The ports are re-enabled when focus is restored to ACID. The Save each track as a separate file check box is now available when rendering projects that contain video. When this check box is selected, each rendered track will contain the video stream as long as the rendering template is configured to render video. Fixed a bug that could cause ACID to crash when switching between audio devices. Fixed a problem that could prevent metronome count-off from working correctly. Fixed a bug that could produce an incorrect recording when changing your project bit depth or sample rate while a track is armed. Fixed several bugs that could occur when using ACID as a ReWire device. Fixed a bug that could cause a crash when routing an input bus's input and output to hardware ports. Fixed a bug that caused an error when rendering to WAV format with rendering templates that use the GSM 6.10 format. When saving projects with soft synth automation, envelope fade types are now preserved. Fixed a bug that caused all uncategorized plug-ins to be moved when moving a single VSTi plug-in from the No Category folder to a user folder. Fixed a bug that caused plug-ins to sort slowly in the Plug-In Manager window. Fixed a bug that prevented peak meters in the Mixing Console window from resetting when stopping playback. Fixed a bug that prevented control surface channel-tracking indicators from being displayed in the Mixing Console window. Fixed a bug that could prevent the Mixing Console from saving its size and layout after restarting ACID. Fixed a bug that could cause Beat-mapped events to be offset when dragging events on the timeline. Fixed a bug that could cause ACID to hang when changing a track's color. Fixed a bug that prevented single-tempo Beat-mapped clips from updating their tempo correctly when using the Initial tempo (BPM) control on the Stretch tab of the Clip Properties dialog. Evopax VTM5 Polyphonic EQ v1.2 Evopax has updated VTM5 Polyphonic EQ to v1.2 and announced D-Quattro, an analog emulation with 15 stereo bands of graphic EQ and parametric filters. Midikarval MidiRouter MidiKarval has released MidiRouter, a VST MIDI processor for Windows made for live performing keyboardists whose gear is a MIDI keyboard and a computer with VST instruments. Toontrack Superior Drummer v2.0.2. Toontrack Music has updated Superior Drummer to v2.0.2.